In an effort to help promote research on Lou Gehrig's Disease (ALS), breweries from around the country are making special craft beers with a unique hop blend in a brewery-based fundraising initiative created to accelerate development of drugs to treat ALS. 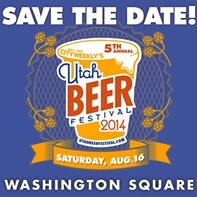 Uinta Brewing Co. is Utah's participating brewery, and its limited batch of Session White IPA used the special blend of experimental hops donated by B.T. Loftus Ranches and Hopunion to create a wheat ale with the hop characteristics of an IPA. Citrusy with subtle notes of pepper and white grape, this wheat IPA was brewed with 40 percent malted wheat and dry hopped with the proprietary Ales for ALS experimental hop blend. Uinta's Ales for ALS beer is a draft-only beer, available at Uinta's Brewpub (1722 Fremont Drive, Salt Lake City, 801-467-0909). During the 2013 St. Patrick's Day Parade, I and others parade watchers caught a glimpse of something strange that we'd never before seen in a Utah parade: a vehicle with Shipyard Brewing plastered on the side of it. We took it to mean that one of the East Coast's largest breweries was soon to be setting up shop here in Utah. And now, 16 months later, we had all but forgotten it, figuring it was some guy who'd gotten lost on his way to Vegas. Well, that long 16-month journey is finally over, and Utahns can start enjoying Shipyard's fine beers right now. Look for Shipyard's Smashed Blueberry Porter, Export Ale and—coming soon—the highly rated Pumpkinhead Pumpkin Ale at select DABC stores. Roosters Brewing and Beehive Cheese are teaming up once again for the eighth-annual Birds & the Bees & the Flowers & the Trees party. This year's event will take place at Red Butte Garden on Friday, Sept. 12 from 6 to 9 p.m. and feature a wide range of Roosters' beers to pair with Beehive's award-winning locally made cheeses. Red Butte Garden will be stunning and in full bloom, the perfect sunset venue for beer lovers and cheese aficionados alike. Live music from Patrick Briggs will also echo throughout the gardens. Proceeds from this year's celebration will benefit Red Butte Garden. Tickets are $60 and can be purchased online. Mike Riedel blogs about beer at UtahBeer.blogspot.com.